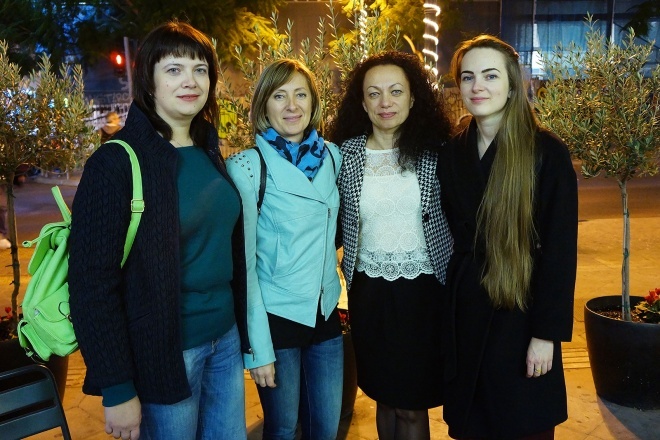 The second part of “See Ukraine: Docudays UA On Tour” took place on 20 – 11 November in Athens. The festival was suspended in May because of the protest meeting organized by pro-Russian forces calling themselves “Greek atifascists”. On the eve of the opening on May 13th the managers of the Exile Room, the main festival venue in Greece, refused to host the festival events after radical groups’ call for a protest rally near the location. The festival was urgently relocated to the Embassy of Ukraine in Greece. The fetival team supported by Association of the Ukrainian Diaspora in Greece “Ukrainian – Hellenic Thought” has been loking for safe location for several months. 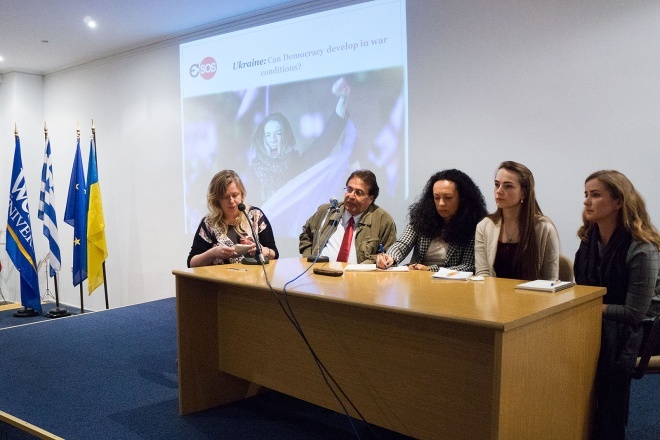 The festival was finally organized at the culture center of Webster University in Athens. The program included films “Ukrainian sheriffs” by Roman Bondarchuk and “The Living Fire” by Ostap Kostiuk. After the screenings viewers were able to discuss films with heroes and authors. Discussion “Is democracy in war time possible?” by Ukrainian human rights activist Oleksandra Matviychuk and Greek journalist Nick Fragkakis also took place. “For me the most interesting part of See Ukraine project journeys are discussions after films and speeches of experts on public discussions. For example, in Athens after “Ukrainian sheriffs” by Roman Bondarchuk people mostly discussed how documentary films that show problematic sides of life in the country actualize the work on these problems. Strong reaction was caused by the discussion ““Is democracy in war time possible?” The audience were arguing, whether it is more important for Ukraine to build the nation or civic society that will respect human rights regardless of language, skin color, religion, sexual orientation or gender. I believe it is for such discussions that we should oganize projects like this” – shares her impressions Yulia Serdyukova, “See Ukraine: Docudays UA On Tour” project coordinator.